Simply Cleaning are your trusted cleaning company when it comes to shop re-fit and retail commercial cleaning. No job is to big or to small. The Client:- Pets at Home stores, Vets4Pets and Companion Care veterinary practices and Groom Room grooming salons. 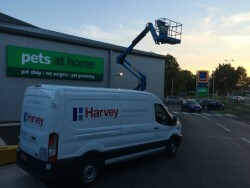 Pets at Home is the UK’s leading specialist multichannel retailer of pet food and pet-related products, as well as operating the UK’s largest small animal services business. Pets at Home operates from 405 stores located across the UK. The Group operates the UK’s largest small animal veterinary business with 353 practices, run principally under a joint venture model using their Vets4Pets and Companion Care veterinary practices and 190 Groom Room grooming salons. The Group also operates 3 specialist High Street based dog stores, called Barkers as well as Ride-away, an equine retail business with a superstore and website. Pets at Home stores provide a unique retail experience, with in-store theatre provided by their small animal pet village, fish aquariums and reptile vivaria. Veterinary care and grooming services are another way in which Pets at Home stores offer more than typical pet shops. As a forward thinking company with ambitious growth plans the first half of 2015 saw the Group continue to execute their space growth strategy. They finished the period with 405 Pets at Home Stores, adding 6 new stores to the portfolio. With further sites in the pipeline for the Barkers brand. The Group are investigating the potential for other new store formats which will allow them to infill between traditional Pets at Home retail park locations. Their grooming salon saw 10 new openings, taking the total number of groom rooms to 190. They opened 15 vet practices, bringing the total portfolio to 353, consisting of 223 in-store and 130 standalone vets. Simply Cleaning were awarded the cleaning contract to build clean and sparkle clean fifteen Pets at Home stores across the UK. Paul Daly, managing director for Simply Cleaning commented: “We were delighted to be awarded the cleaning contracts for Pets at Home as well as the Vets4Pets and the Groom Room grooming salons. 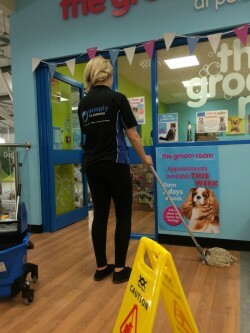 Having cleaned our fifteenth store for Pets at Home, quality shop-fitting cleaning is at the core of our business – we have expert knowledge and pride ourselves on the high standards we deliver. We follow a strict Health and Safety protocol and proudly have a clean sheet when it comes to reportable accidents and incidents. With over 25 years of experience in supplying shop fitting companies we know we can deliver on time and to the right standard for clients. 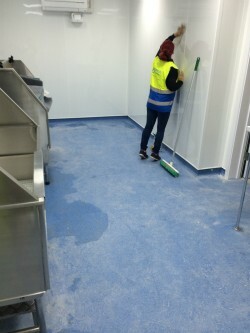 We have extensive experience of cleaning retail units of all sizes. We have a team of highly trained cleaning operatives, removing every trace of builders’ debris before undertaking a thorough clean of the entire retail unit. 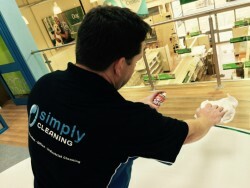 Simply Cleaning are able to work in high street retail units, shopping center units and in large retail park units. In each case we can liaise with the retailer, as well as the building contractor, shop fitters, trades and security teams – leaving the premises thoroughly cleaned. Simply Cleaning remove all builders’ materials, packaging and waste to the skip outside. The team then remove all of the cellophane protection from all of the cabinets, drawer fronts and door fronts. Throughout the store the Simply Cleaning team will vacuum to remove dust and saw dust from all surfaces work tops, counter tops, cupboards, drawers, stainless steel kennels and floors. 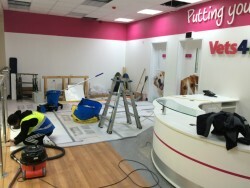 In veterinary Vets4Pets, Doggy Grooming and through the store all surfaces are cleaned and sanitised. All of the internal glass is cleaned to remove paint and sticker residue. On the mezzanine areas, this requires high level cleaning utilising a cherry picker/scissor lift. On store frontage windows the Simply Cleaning team will de-tape from the powder coated frames, we remove stickers and protection from windows and wash down removing dirt from the frames. In the laundry, washroom and hygienic areas all of the protection is removed from the white roc. All of the anti-slip floor covering is scrubbed. In the main retail shop floor all shelving is vacuumed and polished. In the back of house a full builders clean is performed on the toilets, staff kitchen area, mangers room and rest room. Simply Cleaning will provide a service to ensure that the retail unit is highly presentable at all times working with and around other trades to get the ‘job’ done. Where required all types of access equipment can be used as the Simply Cleaning operatives involved will have all the accreditations and necessary PASMA and IPAF certifications. All our RAMS are site specific and are not generic and have been passed by multi national contractors such as:- ISG, Wates, Balfour Beatty, Laing O’Rourke, Kier, Galliford Try, Willmott Dixon, Cowlin, Mowlem, BAM Construction, Skanska and John Sisk. We are used to working with and around other trades. As a professional and certified cleaning business we provide cleaning services to some of the biggest construction firms in the UK. Simply Cleaning has a dedicated team of staff specially trained to NVQ, City & Guilds standards to carry out work on construction sites; all staff are CSCS certification, supervisors are SSSTS and IPAF certified Simply Cleaning are also SSIP, Construction Line, safe contractor, SMAS, BICSc approved. Call Simply Cleaning we have the most qualified and skilled shop refit cleaning team and use the latest in cleaning technology, cleaning products and cleaning services. Simply cleaning can carry out builders cleans, sparkle cleans and re-cleans to meet the needs of your project.